There are some things in life that you just want to buy new. Shoes. Hats. Tires. Food. Luckily, furniture does not fall into this category. If anything, there are distinct benefits to buying used furniture that stretch far beyond the lower price tag. Even if you can afford a brand new accent chair or dining room table, there’s something to be said about buying used. In fact, there are many things to be said. 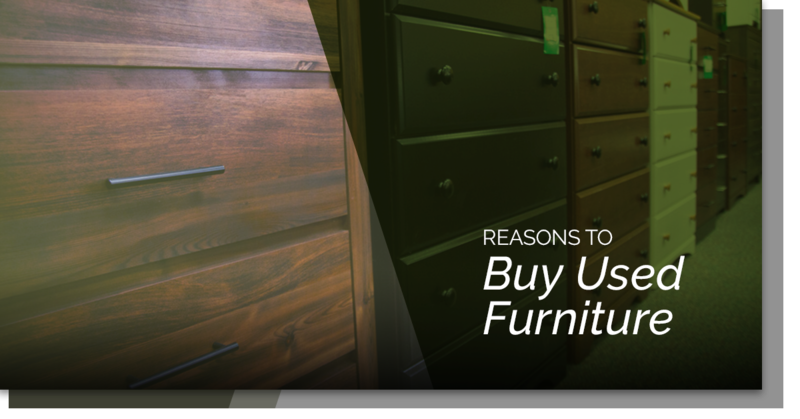 If you’re on the fence about buying used furniture, consider these reasons to buy used furniture below. Think about how much material — wood, plastic, glass, fiber, leather — goes into a piece of furniture. If you dispose of an old piece of furniture and buy a new one instead, you’re wasting resources. Even furniture that seems “trashed” can be salvaged. In addition to the material waste of new production, think about the energy required to build a piece of furniture from the ground-up. It involves farming or harvesting, shipping, manufacturing, and all sorts of embodied energy (or, the energy consumed during all aspects of the production process). When you buy used furniture, however, you’re extending the life cycle of an already-produced product. The only environmental costs associated involve the gas of getting the product to the used furniture store and then to your home. Finally, used furniture doesn’t have the wasteful packaging associated with new furniture. Think about the needless styrofoam, individual plastic wrapping for each component, and shrink wrap you get when you buy a new item. When you buy used, you get the product itself. We could write an entire blog about the environmental implications of new furniture, but this at least paints a general overview of the environmental benefits of buying used. Remember that time you thought you could assemble that store-bought sofa in an hour or so? Then, four hours later, you were still knee-deep in mismatched screws, unreadable directions, and a million tiny nails? Yeah, we’ve all been there. When you buy used furniture, you don’t need to worry about assembly. In fact, most used furniture is much sturdier than anything you’d buy new these days anyway. Save yourself the headache and buy used furniture instead. Finding quirky items is the age-old reason to shop at thrift or consignment stores, and it rings especially true with furniture. Perhaps you already have a fully designed living room, and you’re just looking for that fun accent chair or table. You don’t want anything sterile and you don’t want to pay an arm and a leg for a piece that isn’t the focal point. Used furniture is your best bet, and the shopping process itself is really enjoyable. There’s nothing like scoring the perfect find for your missing furniture piece. Check out this gallery from our used furniture store in Boulder to start your quest for a unique piece. Typically, buying new furniture means supporting big, national corporations. When you buy used furniture, on the other hand, you tend to support local business. No Place Like Home, for instance, has been a staple of the Boulder community since 1986 (when Gunbarrel was still a two-horse town, it seems). As a used furniture store in Boulder, we offer consignment services. This means that we increase the life cycle of Boulder products and transport them locally, saving valuable resources that would otherwise be wasted. If you’re looking for a way to support Boulder business and decrease your carbon footprint, there’s no better way than buying from a local used furniture store. Whether you’ve resided in Boulder for decades or whether you’re a sophomore moving to a house on the Hill, you can find the furniture you want at No Place Like Home. If you want to get rid of furniture and don’t want to deal with the hassle of moving it, check out our consignment furniture program. Our used furniture store features any household furniture item you could want at a fraction of the price you’d pay for new furniture. Stop by No Place Like Home today, located conveniently along antique row.